Brown Mid-Length hair, looking to go ombre? I have brown hair, mid-length, and I want to do something funky with my hair. I was thinking of doing the tips of my hair but then I saw the Ombre style? I think I wrote that right. I want to do this to my hair but I have very fair light skin. I'm worried that doing the tips or ombre on my hair will make it look bad because I don't have long hair. All the images I've seen of these two hair styles are with longer hair. Any advice on this? I have also only dyed my hair 3 times before, I've done the under-layer in a red color, with no bleaching, and I've done that twice, and I've done all over red once before, again no bleaching. It is a two or three-toned coloring which start from a dark base color in root like brown, brunette or red and gradually transit from mid-section into lighter color like blond highlights or red without blunt line. It is a fairly easy process using foil by stylists. Perhaps less stunning on mid-length or shorter hair since there is not much length to show-off the transition but it is possible to make it nice as long as the highlighted part is in right proportion to the length of hair. 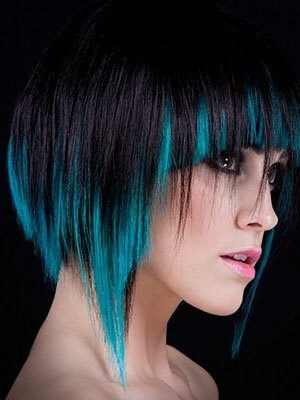 For shorter hair normally called dip-dying and the result is equally attractive. Fair skin tone works great with highlight but try to go for a darker sun-kissed blond (not too contrasting from your base color). That will make it appear more natural on mid-length and works better with brown hair. Answers and Comments for Brown Mid-Length hair, looking to go ombre? I love this kind of hairstyle. She looks so young and elegant looking.